Mofongo de Yuca, to be exact. The mofongo is that large circle of deep fried dough, on the right, made from variable tropical starches like plantain or cassava or yuca. Think crispy, undercooked knish. You need the side of soupy beans to put enough liquid into it so it will be swallowable. 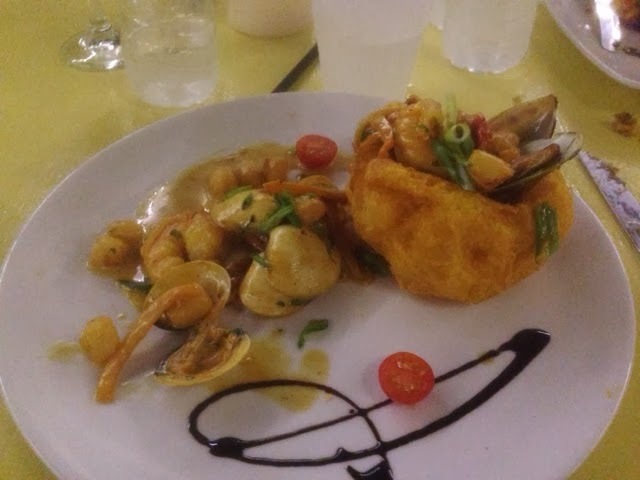 The circle of dough is filled with luscious seafood, as pictured here, or you can get it with steak, or vegetables, or even more yuca, which is incomprehensible.